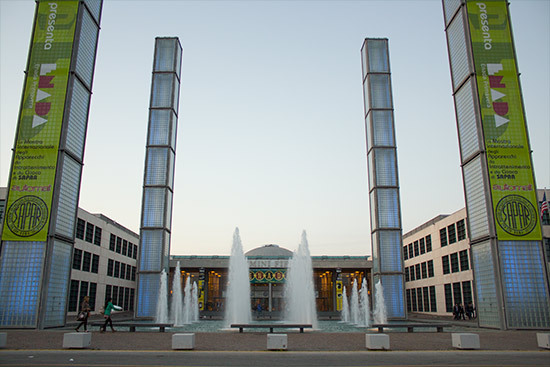 Location: Fiera Expo Centre, Via Emilia 155, 47921 Rimini, Italy. 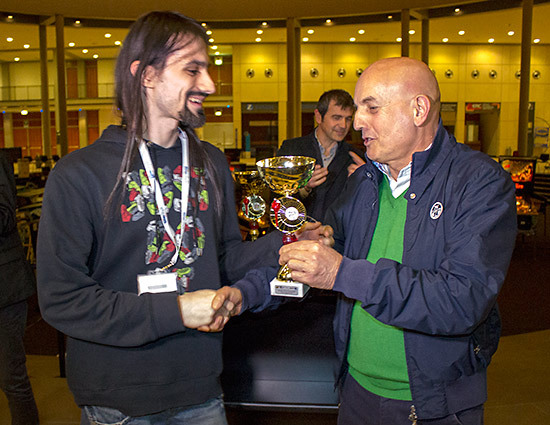 The European Pinball Championship (EPC) is traditionally hosted by a different country each year, and for 2014 it was Italy's turn to carry the torch. 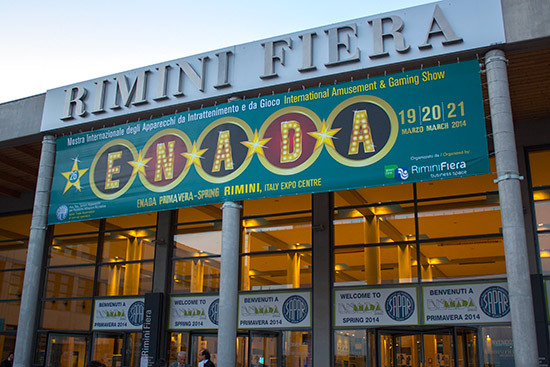 The dates and venue were chosen to coincide with the Enada Primavera coin-op and gaming trade show which is held each spring at the Fiera Expo Centre in the city of Rimini. 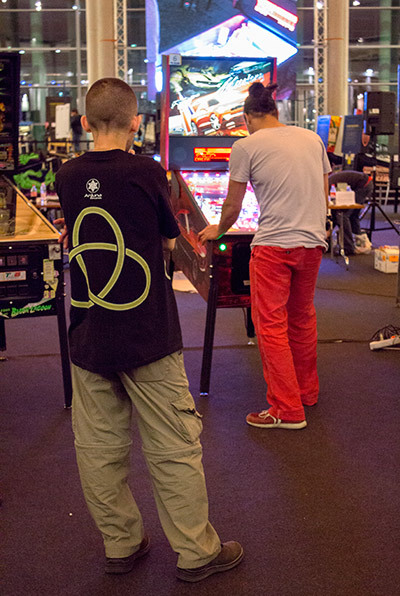 Registered players in the EPC also received free entrance to the Enada show, which meant they could compete in the Enada Pinball Tournament and associated high score competition. 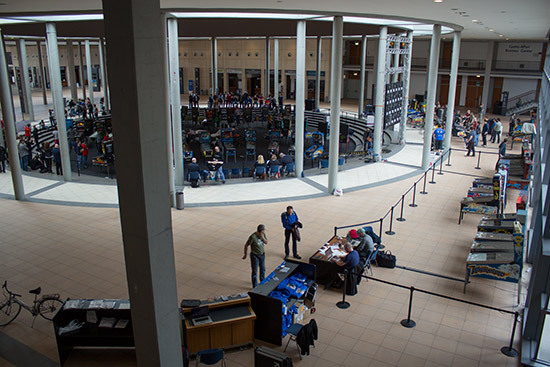 Events in the EPC didn't begin until the Enada show was coming to a close on Friday afternoon. 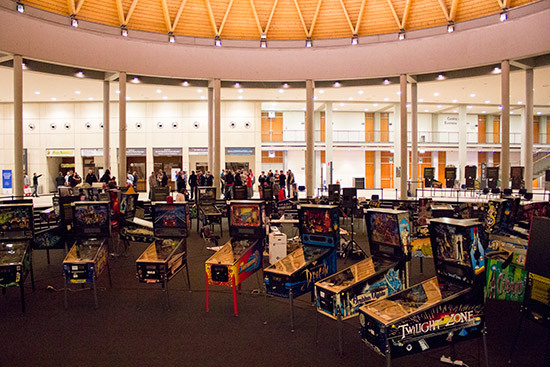 At that point attention turned to the fifty tournament pinball machines set up in a circular arena in the lobby of the Fiera Expo Centre. 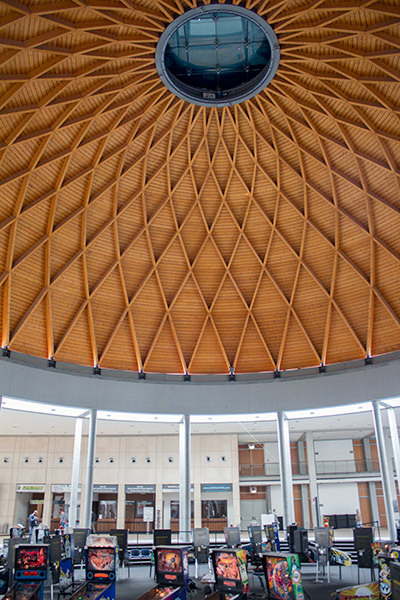 The area was covered with a large wooden-strutted dome which kept the area free from the kind of reflections which so blighted the Enada tournament. 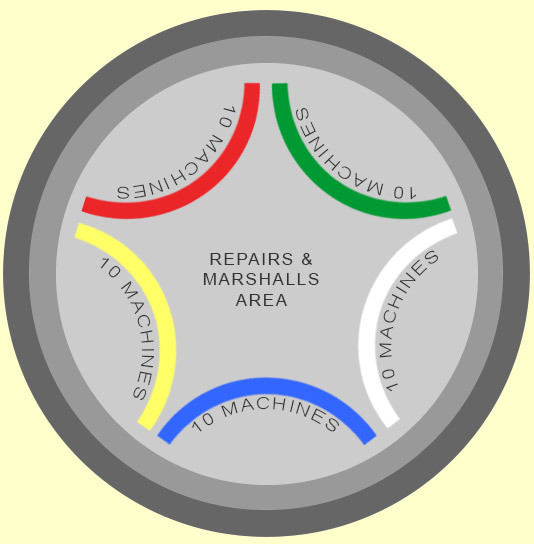 Inside the circular arena, five banks of ten machines were set up with a central repair and marshals area. 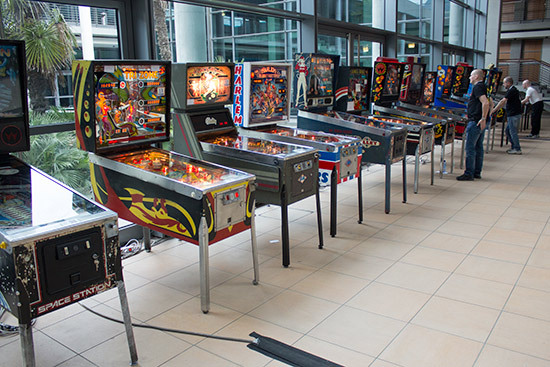 These were all reserved for use in the main EPC tournament on Saturday and Sunday, but there were other machines at the back of the area used for side-tournaments and for practice. There were around a dozen working practice machines set on free play. They were: The Flintstones, Funhouse, Star Wars Episode 1, Airborne, Space Jam, Theatre of Magic, Medieval Madness, Grand Prix, Mary Shelly's Frankenstein, Cirqus Voltaire, Last Action Hero, The Addams Family and The Champion Pub. There were in fact quite a few more machines but these appeared to be broken all weekend, and before the two days were out several of those machines above joined the casualty list. 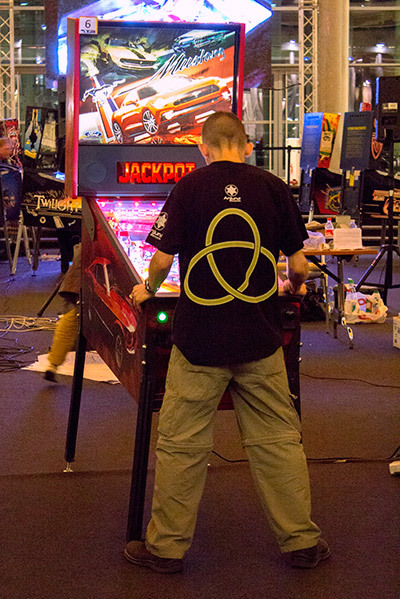 With a total of 240 competitors, it was often difficult to find a working practice machine to play. Backing onto the practice area was another bank of ten machines used for the Country Tournament which took place on Friday evening. 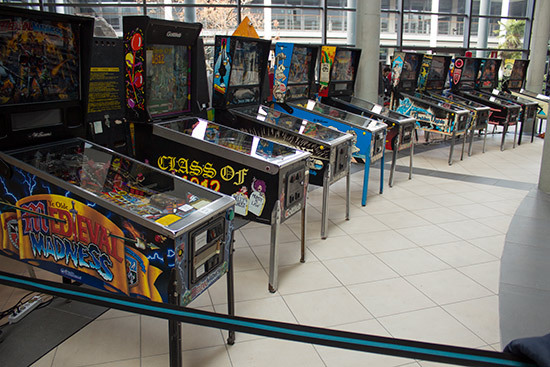 The final bank was positioned further along the back wall of the lobby and consisted of 13 machines from the years 1980-1990 which were used in the '80s Tournament. A couple of spare machines were also included in the line-up. They were a backup Pinbot and a Space Station. 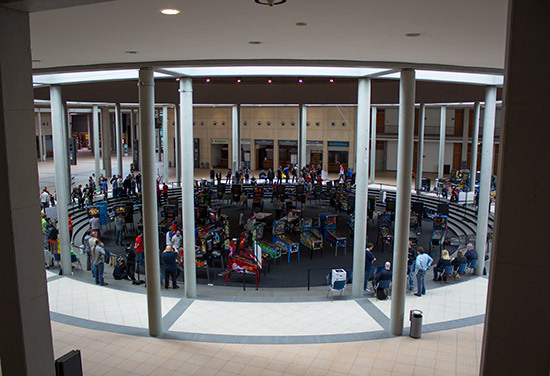 There was plenty of space in the Fiera Expo Centre's lobby to accommodate all the machines and the players. Here's how those different areas fitted together. 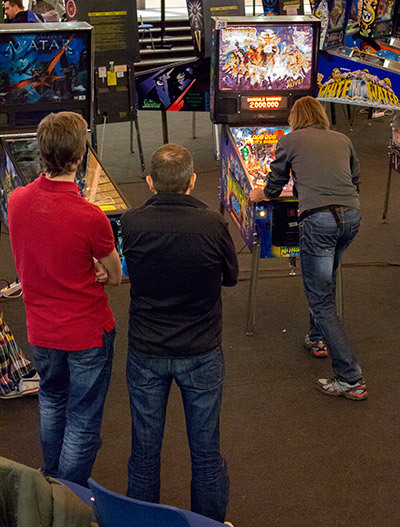 All machines positioned in the central arena and used in the main EPC tournament were from the dot-matrix era. They were mostly Williams/Bally models, with a number of Sterns and the occasional Data East and Gottlieb/Premier thrown in to the mix. 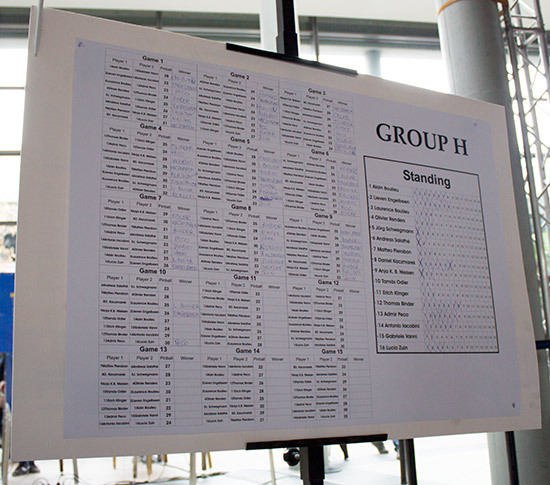 The 240 players were split into 15 groups of 16 players (A to Q, minus J & K for some reason) and those 15 groups were further split into 3 sessions of 5 groups each. 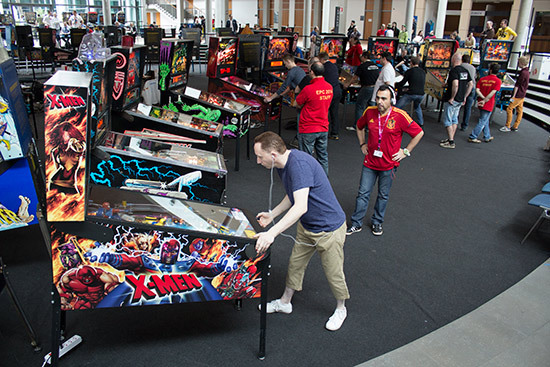 The 3 sessions were played in consecutive five-hour slots on Saturday, and each group was allocated one bank of machines on which to play all their matches. 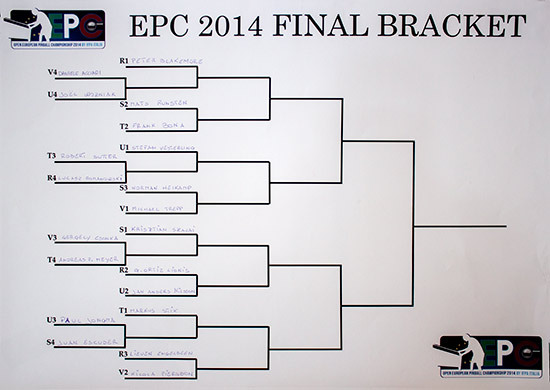 Here's the full list of machines in each bank of the main EPC tournament. 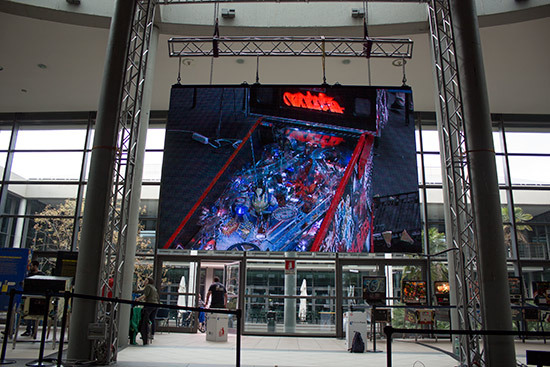 At the back of the arena was a large LED display which showed video of selected games during the tournament. The display was nice and bright, but quite low-resolution which made reading some of the score displays a little tricky. 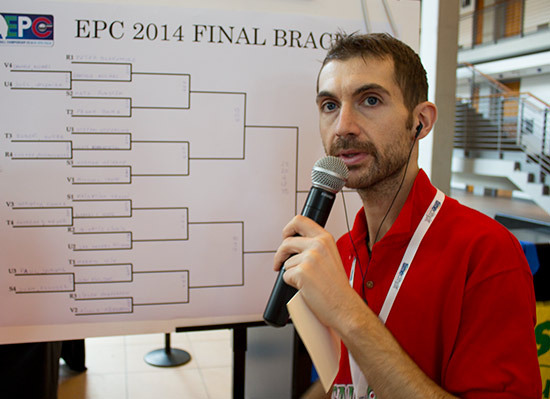 But the first EPC event to begin was the qualifying round for the '80s Tournament. 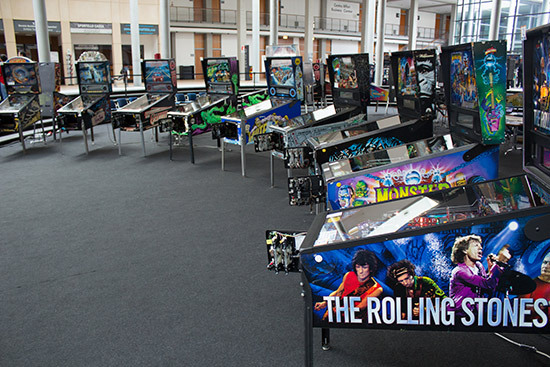 Players could choose any five of the machines and play a single game on each of them. The scores were ranked, with the highest scorer earning between 92 and 94 points. Others received fewer points on a sliding scale which depended on the number of scores recorded on that machine. Those who wanted to avoid the crowds on Saturday could play some or all of their '80s Tournament games on Friday, starting at 2pm. 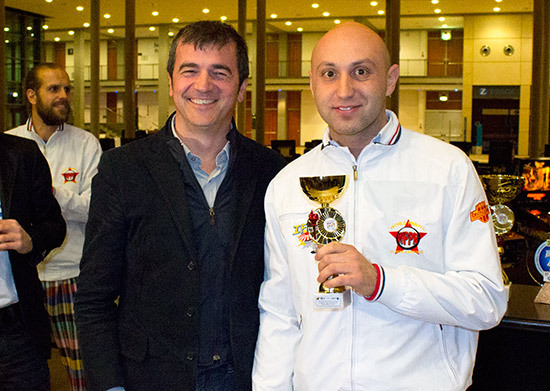 Qualification then continued until 10pm on Saturday, by which time 236 players had taken part. When qualifying ended, the top 8 players would move on to the semi-finals and finals which would be played on Sunday afternoon. 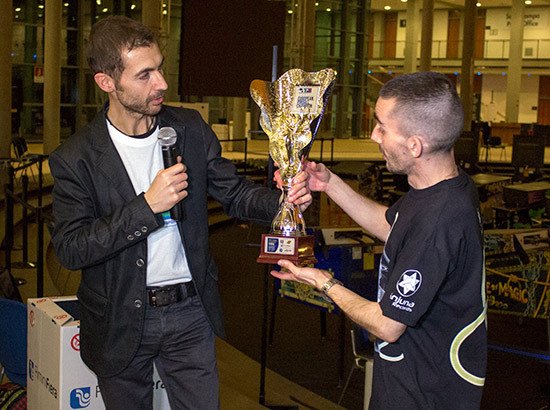 The second EPC event to begin was the Country Competition which began at 7pm on Friday and pitched teams from 15 European countries against each other. 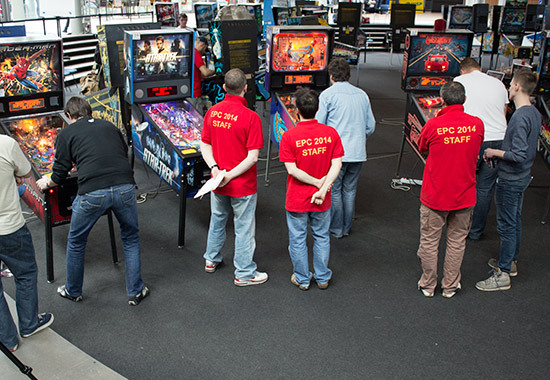 Two groups were formed - one of eight teams and another of seven - and each team played a single match on the five machines allocated to their group. When everyone had played, the scores were ranked and the top four teams from each group went through to the second round. 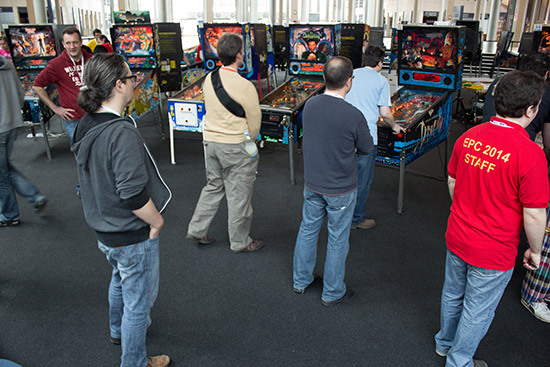 All games were played as 1-player, 4-balls, with each team member playing one of the balls. The eight remaining teams then played a head-to-head double-elimination format until just two teams remained. 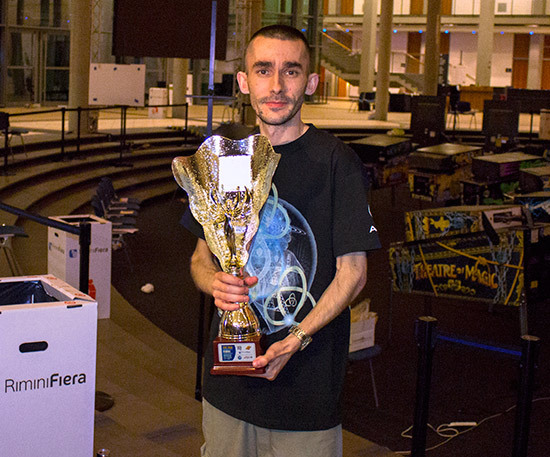 They were Germany and Spain and as play continued into the night it was Germany who triumphed in the final match to become the new EPC Country Tournament champions. Saturday morning brought the start of the main EPC tournament with the first five groups (A-E) consisting of 80 players who started their matches bright and early at 9am. The 16 players in each group played a single 3-ball game against each of the other 15 players. The four players with the most wins in each group would go through to the play-offs on Sunday. The match order and machines used were predefined and printed on large boards posted next to each bank of machines. As games were played, a running tally of wins was shown on the right of the board. When all 15 rounds had been played, the four players with the most wins moved on to the next round. Generally speaking, 10 or 11 wins from the 15 games would be enough to qualify. Any fewer wins and you would be in danger of entering a play-off or simply not qualifying. Ties for places 1-3 were decided by IFPA ranking, but any tie for the fourth qualifying place was decided by a play-off match. Where you finished in your group would be important when the play-offs began on Sunday. The machines were in good condition and most problems were dealt with quickly. 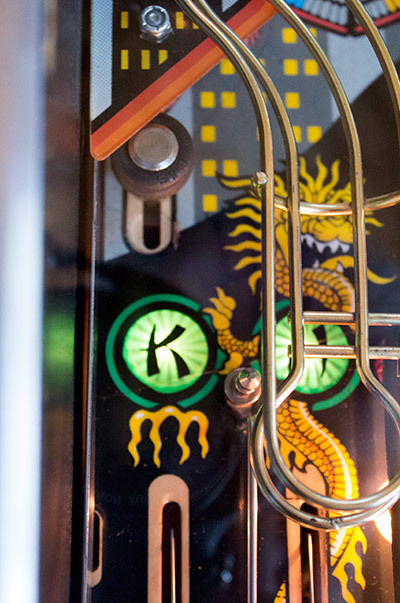 The tilt settings on some machines - particularly Monster Bash machines for some reason - were incredibly tight, almost to the point where even playing with finger tips would still result in a tilt. 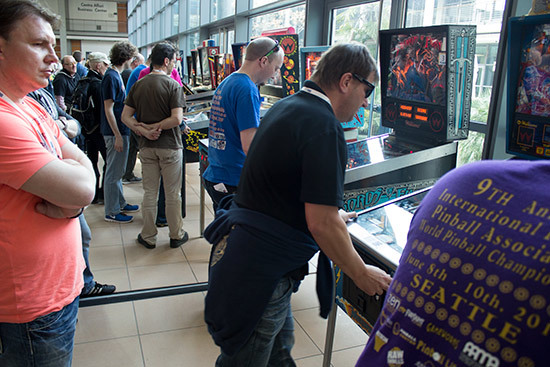 However, given the number of players and games played, the machines generally held up well and there were plenty of marshals around to register match results. The EPC machines were made harder to play by removing the inlane post rubbers and opening the outlanes up to maximum width. 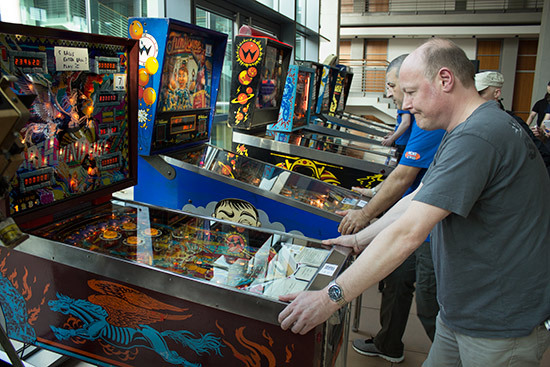 Other changes included removing centre posts, using thin flipper rubbers, fitting shorter 'lightning' flippers, and installing short flipper plungers so it was harder to cradle a ball. Each of the three sessions was allocated five hours to complete the 15 rounds of matches. This initially sounded optimistic, but the difficulty of the machines ensured the matches were completed surprisingly quickly with plenty of time to spare. These 60 qualifiers returned on Sunday morning, at which point they were divided into 5 groups of 12 and played another session where each competitor played a single game against everyone else in their group. Once again, the top four progressed to the next round. The following rounds were played in a best-of-three single-elimination format. 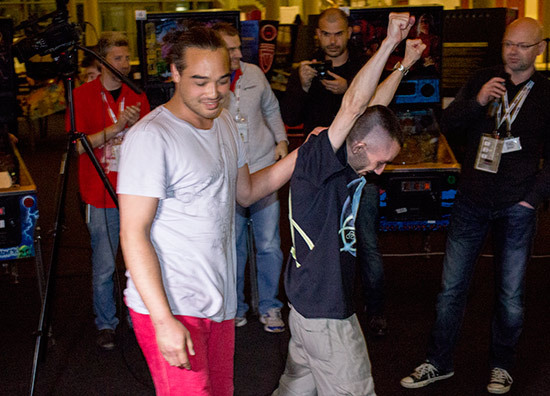 The top two players from each group earned one bye, as did two of the third place qualifiers. The remaining eight has to play in the first round. With the possibility of a place in the final looming, any malfunctions were given extra scrutiny to ensure both players were treated fairly and nobody gained an unfair advantage. At times, though, the only solution was to abandon the game and start again on an alternate machine. As Sunday afternoon wore on, crowds gathered to watch the quarter-final matches. Before we move on to the semi-finals of the EPC, the semi-finals and finals of the '80s Tournament were held at the back of the lobby. These eight were divided into two groups of four and each group played a single 3-ball game on a pre-selected machine - either Police Force or Torpedo Alley. The top two scorers would advance to the final. On Police Force it was a win for Robert, with Jérémy second, Martin third and Patrik fourth. 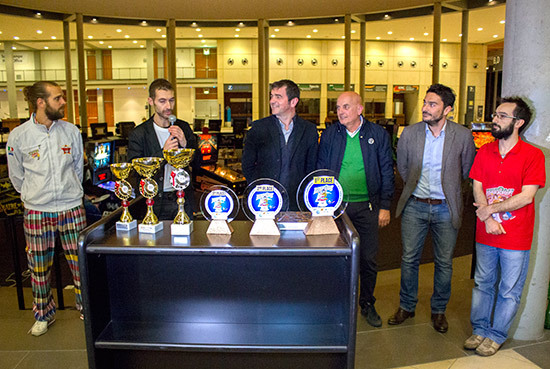 Meanwhile, Roberto was the winner on Torpedo Alley with Daniele second, Manuel third, and Federico fourth. So with the last four decided, only the final on Harlem Globetrotters remained. Once again it was a single 3-ball game and Robert Gagno continued his good form in the semi-final with a score of 215,170. That score proved to be good enough for the win, with Roberto Pedroni getting closest with his score of 174,150. Daniele Acciari was third on 109,360 with Jérémy Reynaud ending fourth on 74,160. And so we come to the penultimate stage of the main EPC final. 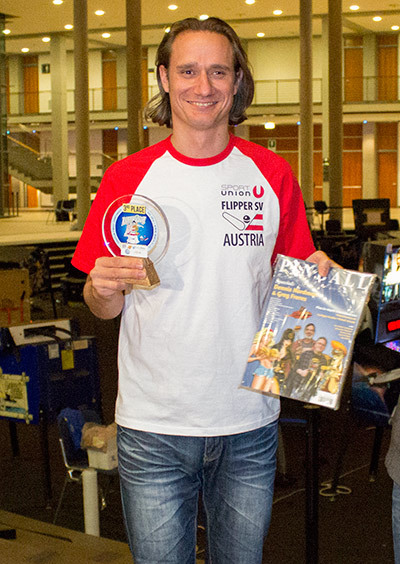 In the two semi-finals we had Switzerland's Michael Trepp against Sweden's Mats Runsten, and Krisztián Szalai from Hungary against Markus Stix of Austria - a truly pan-European final four. Michael defeated Mats 2-1 while Krisztián had a 2-0 victory over Markus to give us our final pair. 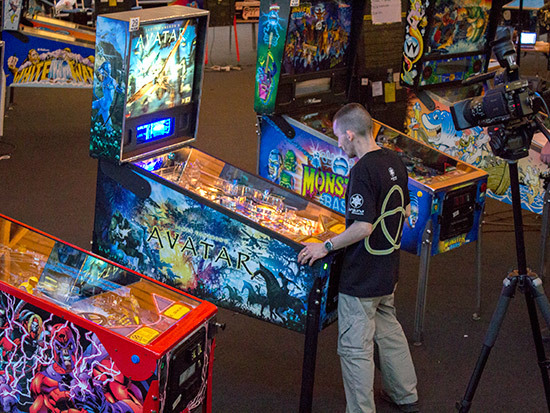 The final was a best-of-five match on the pre-selected machines which began with Avatar. After two balls Krisztián had drawn out a good lead of 30M to Michael's 3M, a lead he extended further on his last ball, finishing on 49M. Michael needed a great last ball to move into the lead, but unfortunately it didn't come and he ended on 3.5M, giving first blood to Krisztián. 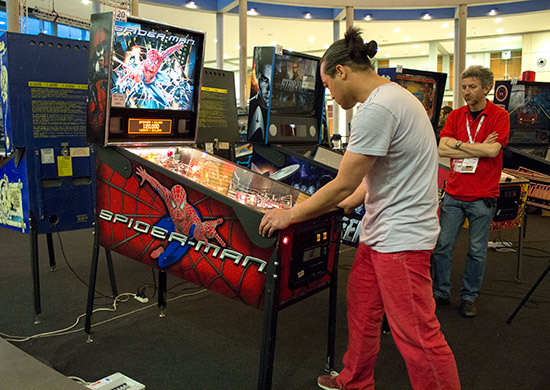 The second machine was Spider-Man and the match was tight after the first ball when Krisztián had a 53M v 40M lead. But Krisztián sealed a second victory with an excellent second ball which pushed his score way up to 224M. Although Michael managed to more than double his score on ball two, his 86M total was a long way short and he only managed to add another 3M on his last ball. The action move on to Congo and the switch to a Williams machine allowed Michael to turn the tables on Krisztián. A consistently impressive game saw his end-of-ball totals rise from 361M to 509M to finish on 993M. Just the first ball would have been enough, as Krisztián ended his third ball on 138M. 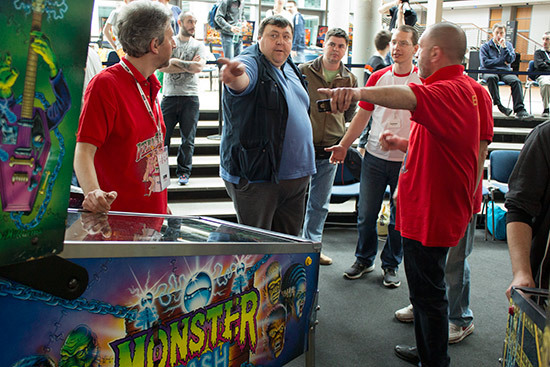 Michael had avoided the 3-0 whitewash and took the match into a fourth game, which was played on Monster Bash. Would Michael be able to dominate the Williams machines and keep his title hopes alive? Initial signs looked good, as he led after ball one by 17M to 0.6M. Both players tilted out their second ball, but by the time the tilt bob had settled Michael had extended his lead by 24M to 2.6M. 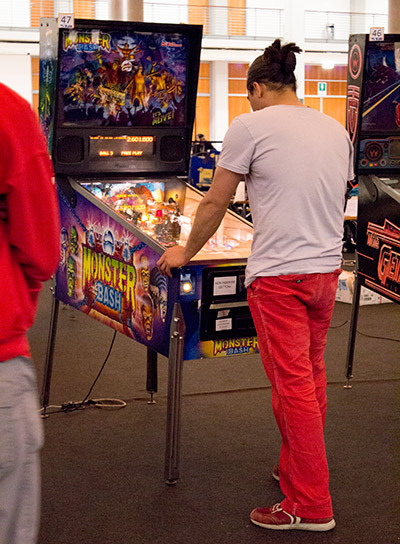 But scores in Monster Bash can take rapid leaps if a multiball starts, so Krisztián was far from out of the contest. However, Michael third ball more than doubled his score to 69.8M which left Krisztián a mountain to climb. He never really got started on a fight back and drained ball three on just 4M. With two matches each, it was now sudden death. 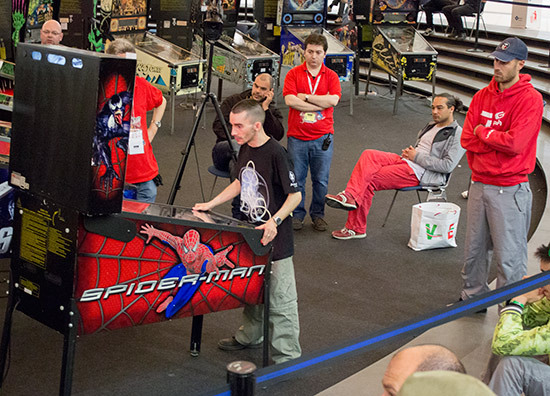 The fifth and last game of the final was played on the newest machine at the tournament - Stern's Mustang Pro. Krisztián played first and racked-up a reasonable 9.45M on ball one. Michael didn't start as well and finished his first ball with 2.81M, a situation not improved by Krisztián's second ball total of 15.1M. But Michael started a comeback and ended his second ball in double digits on 10.9M. Krisztián added another 5M on his third ball to end on a reasonable, if not spectacular, 20.93M. If Michael could add another 10M, he could take the win. 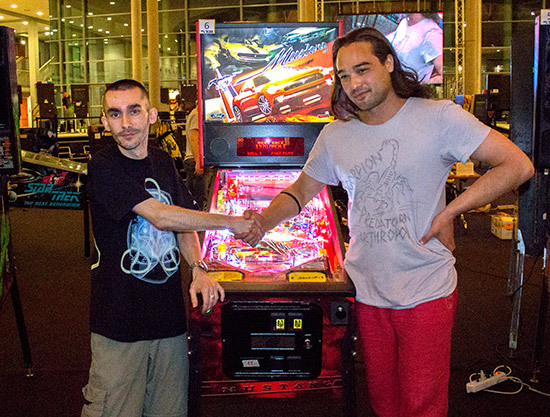 Once again though, the Stern machines favoured Krisztián, and Michael drained his third ball just below the 12M mark, making Krisztián Szalai the new European Pinball Champion. 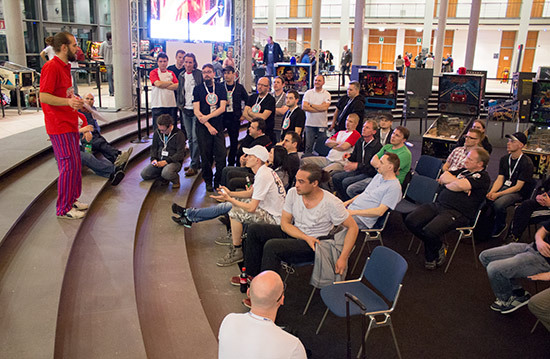 Shortly after the main final, presentations were made to the top three in both the EPC and the 80's Tournament. The 80's Tournament awards were handed out first. 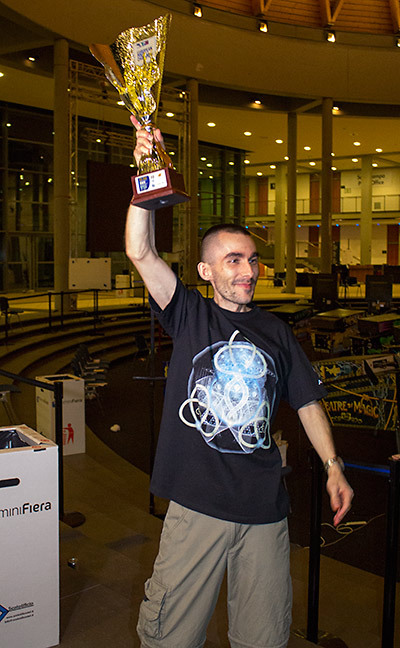 Robert Gagno who won the '80s Tournament wasn't able to be present at the awards ceremony to receive his trophy. So we move on to the main EPC, and in a best-of-three play-off held on Star Trek, Creature from the Black Lagoon and Monster Bash, Marcus Stix won the first and third games to secure third place over Mats Runsten who ended fourth. 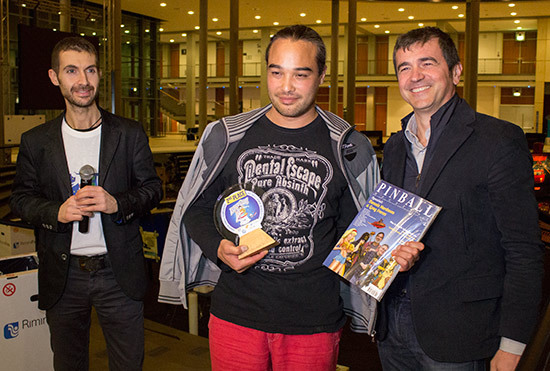 The top EPC players won custom trophies and copies of Pinball Magazine. 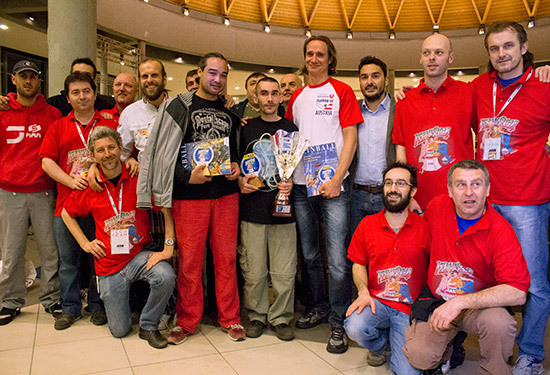 With the awards presented, the European Pinball Championship of 2014 drew to a close and the hard work of dismantling the machines and clearing up the Fiera Expo Centre began. Congratulations to the organisers in running a successful and enjoyable tournament weekend worth of the EPC name. The venue was excellent and the nearby snack bar and shopping mall ensured you never had to roam too far to buy the essentials. 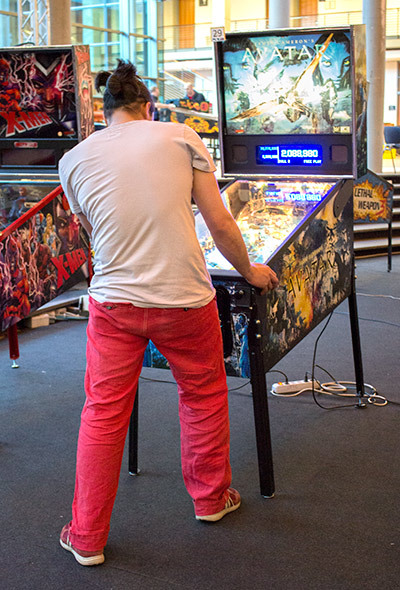 Although it seemed ambitious to get fifteen rounds of matches completed in five hours, the organisers managed it with time to spare. 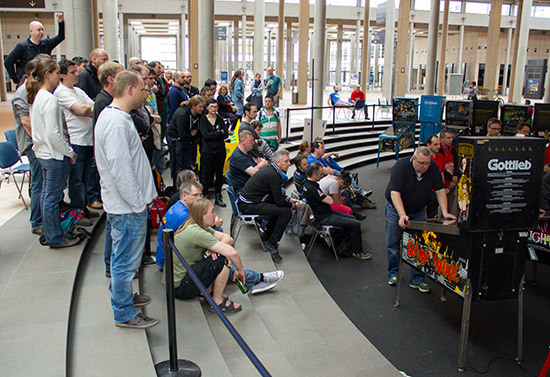 The layout of the machines and the tournament format was certainly appreciated by the players and spectators alike. One suggested improvement would be an increase in the number and condition of the practice machines, and the return to the practice pool when machines were no longer needed for tournaments. 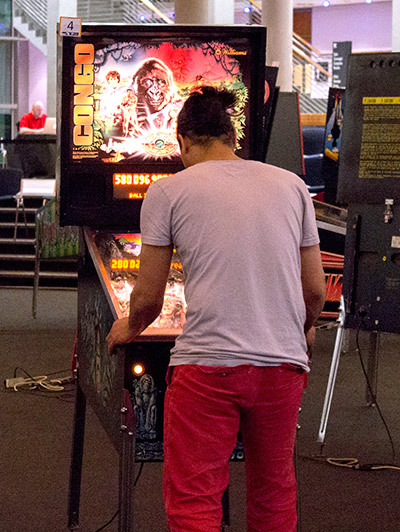 Fifteen '80s machines were set up and cordoned-off all day Sunday, despite only three of them ever being used of just one game each. 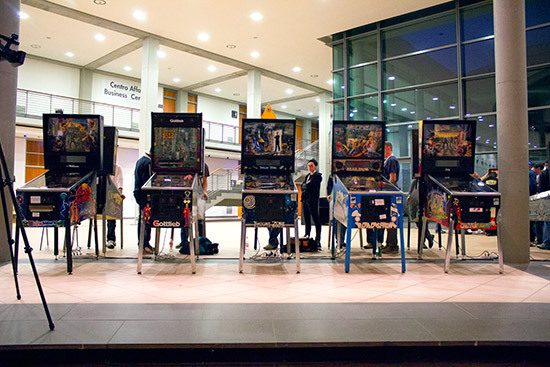 The same with the Country Tournament machines which were only used on Friday night. We would also suggest a clearer means of resolving problem with machines. At times up to a dozen marshals were crowded around a problematic machine with nobody seemingly in charge and able to make a definitive decision. These are minor issues though. The important thing is that the Italian organisers took on the onerous task of organising the biggest tournament in Europe, and pulled it off with aplomb. 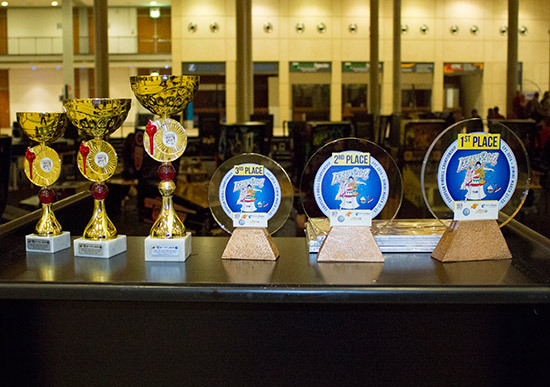 Full results can be found on the europinball.org website and - shortly - on the IFPA site. 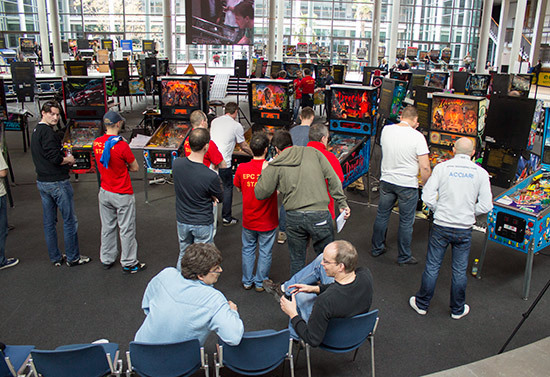 The European Pinball Championship returns in 2015 when the hosts will be Belgium.